Officials at the Imperial War Museum airfield are to examine airshow safety after the crash of a World War II bomber on Monday - the third crash there in two months. Two men had a lucky escape when the Bristol Blenheim bomber crash "belly-flopped" on the grass near the busy M11 motorway. Experienced pilot John Webb and a crew member walked away from the damaged historic aircraft after it developed engine trouble as it came into land at its base at the museum at Duxford near Cambridge. It was unclear why the plane's wheels were not deployed but Ted Inman, Duxford's director, said the men were "very fortunate" to have escaped injury. The extent of the damage to the plane has yet to be assessed. Meanwhile, an inquiry has been launched by the Air Accident Investigation Branch. 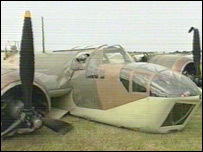 The crash landing, which happened at about 2015 BST on Monday, was the third historic aircraft accident at the airfield this summer. 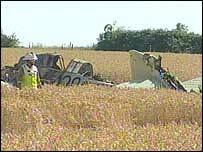 Two men were killed on 12 July when a vintage Fairey Firefly crashed during an airshow. Three weeks later, a two-seater L39 Albatross came down in fields close to the museum. The pilot escaped injury. And on 2 June 2002, a privately-owned former Soviet air force two-seat L-39 military jet trainer aircraft came to rest on the M11 after going through the boundary fence at Duxford. Mr Inman said: "We've got to take a hard look at what we do to see if there is anything more that can be done to improve safety. "We have been having a very bad time of late and we understand the concerns of local people. We are doing what we can to reassure them. "The standards we employ match those and in certain areas exceed those set down by the Civil Aviation Authority. "We are ready to announce a number of changes to airshow operations after consultation with the CAA. "Obviously we will look at what happened to the Blenheim but we still intend to announce those changes before our next airshow on 6 and 7 September." Pilot John Webb is an experienced commercial pilot who has also specialised in flying the Blenheim, which is operated by the Duxford based Aircraft Restoration Company.